Young’s Modulus is a mechanical property of the material where it can be called as modulus of Elasticity/Elastic Modulus. An English physician and physicist named Thomas Young described the elastic properties of materials. 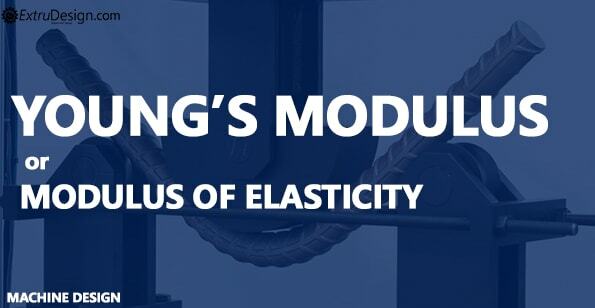 Young’s modulus can be defined as simply the stiffness of a solid material. When an external force acts upon a body, then the body tends to deform. After removing the load then the body gets its original shape. This is called elastic deformation. But as the load crosses the elastic limit of the material then the body will be permanently deformed. Young’s modules state that Stress applied to the body is directly proportional to the strain induced on the body. It’s further simplified as follows. As the load increases on the body, the deformation will also increase. When the load decreases then the deformation will be decreased(Simply Not a permanent Deformation). So we can write Youngs Modulus = Stress/ Strain. In other words, Hooke’s law stated the same relation. When a load is applied on a body within the elastic limit, then the body is going to deform with respect to the load applied on it. After removing the load on the body, the body will get its original shape this happens when the body is within the elastic limit. This phenomenon can be explained with a graph between the stress and strain of the body. The line OA on the graph shows how the stress changes with respect to the strain. So here it is a straight line. that represents the proportionality. This principle is used in making mechanical springs. If the applied load is not within the elastic limit then the body will tend to permanent deformation. The Young’s modulus or Modulus of elasticity is a numerical constant for the material. We have listed youngs modulus for some of the materials.